Back to basics. That's how I would describe the Gaerne Balance Oiled Boots. Adventurer tourers and dual-sport riders are decidedly less prone to buy the multi-hued and trendy gear that is so popular with the motocross crowd. These Gaerne boots have a traditional leather look and feel that is sure to appeal to those with more subdued tastes. Gaerne makes two versions of the Balance boots. One is the Pro-Tech "black" version, which is water resistant and has a scuff resistant finish. The other version -- the one that is the focus here -- is the "oiled" variation in brown. These oiled boots have a much shorter break-in period than most dirt boots, and will show scuffing (which I call character). The boots are Italian-made with a thick 3-3.5 mm top-grain leather upper double-stitched to the rubber sole with a leather insole. The boots are claimed to be waterproof with a breathable "Gaerne Drytech" membrane liner. They feature three replaceable alloy buckles. The Balance boots have a traditional gum rubber sole for feel and control. They are also substantially lower than regular MX boot soles. To cut to the chase, I like these boots. They have a traditional look and a quick and comfortable break-in. 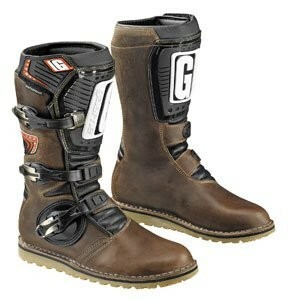 As an all-around adventure or dual-sport boot, the Gaerne Balance Oiled Boots would be a solid choice.